Andrew Brown's Blue-Black Control deck, chockfull of counters, removal, and Interpret the Signs took down a previously unbeaten Matt Sperling to secure victory at Grand Prix Denver. On a cold Saturday morning, 1497 players made their way to Denver, Colorado with hopes of bringing home a Grand Prix trophy. After nine rounds of Standard, only 157 players remained. Abzan strategies had quickly established themselves as a dominant force with a staggering day 2 retention rate. Players began battling their way through another six rounds of swiss in the second day of competition. 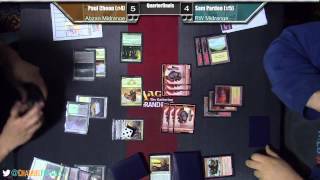 Pro Tour Magic 2015 Top 8 Competitor, Matt Sperling quickly distanced himself from the pack and remained the only undefeated player in the room as the tournament made it’s way into the elimination rounds. Fifteen rounds of Standard were in the books and only eight remained. Matt Sperling, Edward Nguyen, William Jensen, Paul Cheon, Sam Pardee, Valentin Mackl, Andrew Brown, and Lukas Parson entered the elimination rounds with high hopes. Andrew Brown and his Blue Black Control deck dispatched of Edward Nguyen in quarterfinals before making quick work of Valentin Mackl in the semifinals. 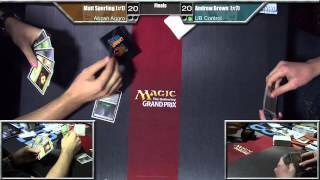 Only two remained, an undefeated Matt Sperling and Andrew Brown in his first Grand Prix Top 8. 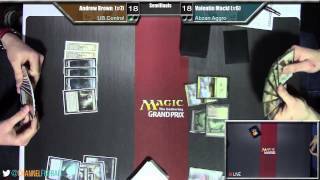 Brown’s Blue Black Control deck overcame Sperling and his aggressive Abzan deck in two games. Andrew Brown is your 2014 Grand Prix Denver Champion! Welcome back to Grand Prix Denver! Yesterday, 1497 players battled their way through nine rounds of Standard. Of those, 157 performed well enough to return for the second day of competition. Today, players will be playing another six rounds of Standard before we cut to the Top 8 elimination rounds. Leading the pack with unscathed records are Valentin Mackl, Andrew Brown, Corey Rethke, and Matt Sperling. Coming into this weekend, a lot of people expected decks built around Sidisi, Brood Tyrant to be out in force, but entering the second day of competition it has become clear that the new boss is the same as the old boss; aggressive Abzan strategies showed up in huge numbers and put more people into the second day of competition than any other archetype. Token strategies that take advantage of Jeskai Ascendancy were surprisingly successful as well. What archetype will reign supreme when the dust settles here in Denver? Stay tuned for continuing coverage of Grand Prix Ottawa! Day 1 of Grand Prix Denver is in the books! 1,497 players came to battle, and only four emerged completely unscathed. Matt Sperling, Valentin Mackl, Corey Rethke, and Andrew Brown are all 9-0 after some intense clan battling. And after a super-intense last round against each other, Paul Cheon and Corey Burkhart settled for a tie to finish 8-0-1. All the expected decks are represented, and there are some surprises. Abzan Aggro has been showing up in larger numbers than before, and there is more Jeskai colors floating around the top tables, including a saucy control deck from Andrew Cuneo, who’s at 8-1. There are many more four-color decks than previously, and even a few five-color Chromanticore monstrosities lurking their heads (oh, and a Hornet Nest Combo deck). It’s been snowing all day here in the mile-high city, but that hasn’t stopped any of these intrepid planeswalkers from trekking into the tournament hall and beating the snot out of each other. And oh, we’re doing it all again tomorrow. Tune in tomorrow for the exciting conclusion of Grand Prix Denver! The hashtag for the Grand Prix Denver is #gpden. Join the conversation!